So good to be back from Italy — it is always great to get away and explore local cuisines and markets but nothing beats having your feet firmly planted in a space where all the tools are your own, namely, my very own kitchen. I have had a warming stew or cassoulet on the brain with fall coming in and upon returning home I had received the latest issue of Saveur magazine. In the current issue I found the meal that kept going on in my head — a Chilean dish called braised beef stew with a garlic cream. 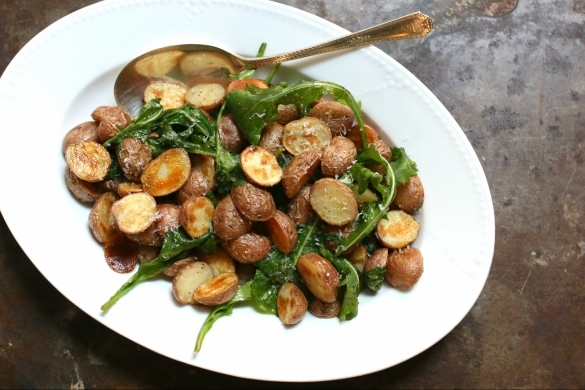 This dish was absolutely amazing and the side I created could not have been simpler — warm roasted potatoes with fresh arugula. 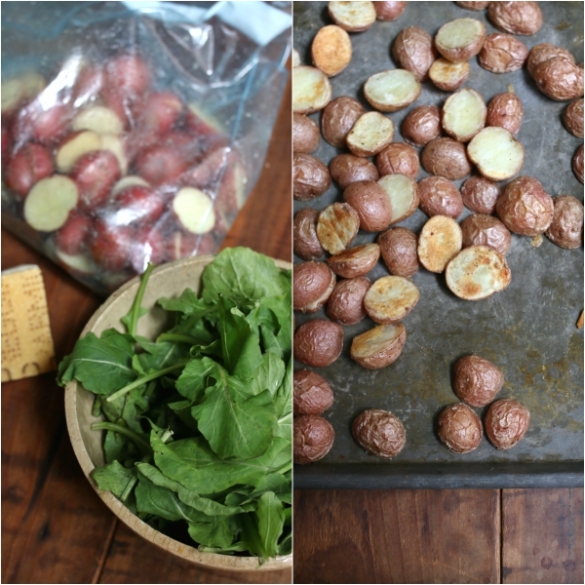 Preheat your oven to 400° and begin by rinsing, drying and then slicing the potatoes lengthwise. 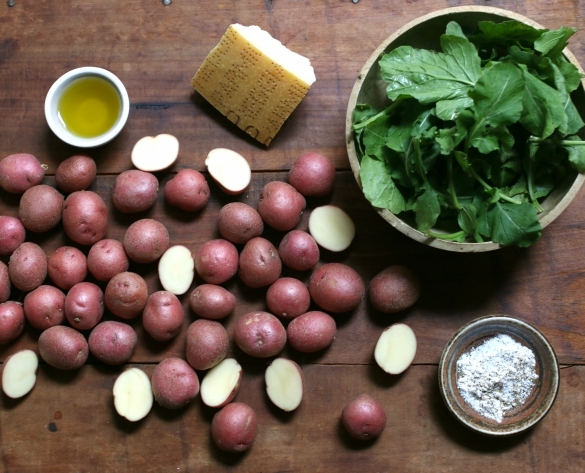 Place the potatoes in a bowl or freezer bag and add 1 tablespoon olive oil, stirring or shaking to coat. Add flour, salt and pepper again stirring or shaking to coat. 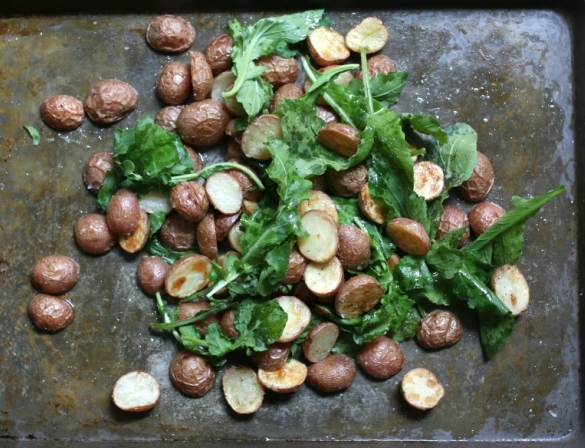 Arrange the potatoes on a sheet pan (careful to separate any that stick together) and bake for 20-25 minutes. Halfway through the cooking process use a spatula to stir the potatoes, scraping any that are sticking from the pan. Remove the potatoes from the oven and allow them to cool for about 5 minutes. Add the arugula and drizzle with remaining olive oil, stirring everything to coat. Doing so will allow the arugula to wilt and warm slightly. ...and grate parmesan cheese to create a light dusting. Serve this dish warm and if your are making the beef dish the garlic cream sauce also pairs with the potatoes. 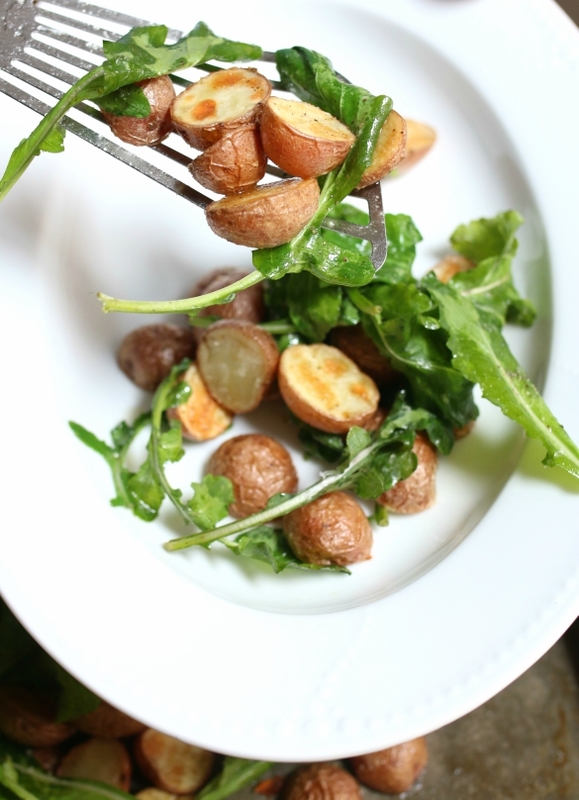 Although the traditional recipe called for fries, I decide I wanted to have a starch with a healthy green — and the bite form the peppery local arugula really made this dish. 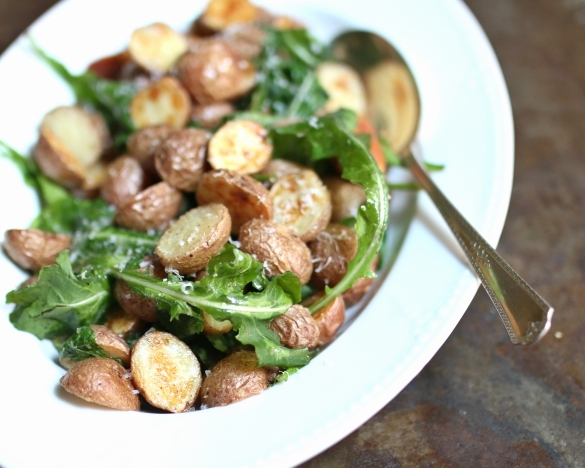 So I suggest hitting up your local famers market for both the potatoes and arugula!